Operational efficiency means money saved. Your business value would increase if your manufacturing process ran more smoothly, required less human intervention and used the latest robotic technologies. Bardons & Oliver’s team of certified engineers, designers and technicians provide the engineering consultation, full design and 3D modeling to optimize your system through automation. Automation improves productivity and throughput, enabling the processing of hundreds, or even thousands of parts, shift after shift. A well-engineered process ensures constant flow of raw material into the machine and having the right part program and tooling and allows for the removal of the finished part from the machine's work zone. The result is the more efficient handling of thousands of your finished parts. 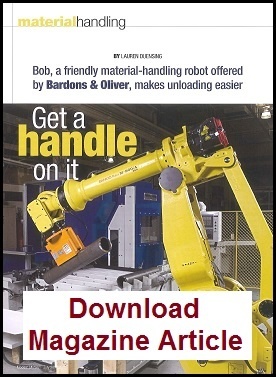 As an authorized FANUC robotics integrator, we offer a full range of robotic and automation systems solutions, including automation design and installation, for new Bardons & Oliver systems, field upgrades for existing Bardons & Oliver systems or Machine Tools from other builders. 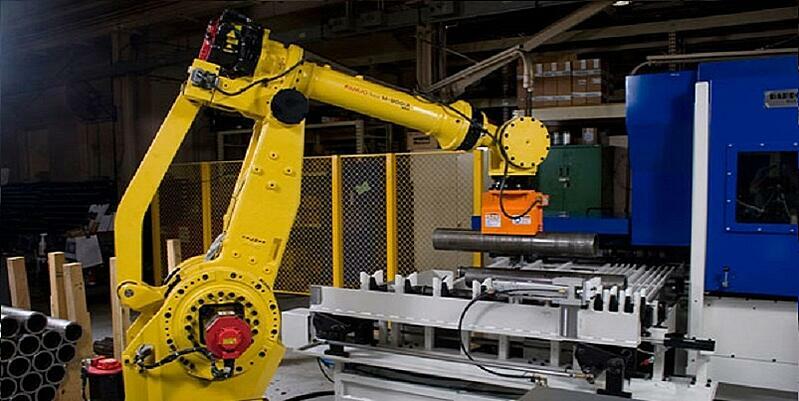 As a full-line Machine Tool builder, we design and build your automation system. We make sure you have the training and support you need to optimize the system and we take full responsibility for its performance. Our diverse machine building and automation experience will meet your most exacting applications. Bardons & Oliver has decades of experience building systems that handle material to process long tubes and bars to finished parts or precision blanks in one step. We’re experts at helping you automate to handle any length of incoming tube or bar and our systems can unload almost any length or diameter workpiece. An added benefit is that your machine operators experience less fatigue and can focus on higher-level tasks. Whether designing a factory of the future to meet strict production and SPC requirements, a simple pick and place system to handle a few thousand parts a shift, or a large-capacity system to do the heavy lifting, Bardons & Oliver should be part of your process. Bardons & Oliver has been meeting customers’ challenges with custom engineered solutions for more than a century. Our expertise, technology and commitment to innovation have led the industry in developing solutions for every application.